Through my blog I use nicknames for most of the people involved to provide them some degree of anonymity. As more people are referred to in my travels, I will add them to this page. When I am using terms like “The Wife” or “The Girlfriend” please consider them a nickname instead of an objectification in any way. To avoid spoilers, the descriptions may increase later on. My Dad – Air Traffic Controller, Tai Chi practitioner who loves talking to strangers. My Mom – Retired teacher’s assistant who got addicted to international travel after my Japan adventures. Katsuragi – one of the few Japanese people living at Hello House. Nobody really knew how old she was or what her job was, but she was always a lot of fun to be around. Lux – Female friend and fellow Canadian from Hello House. Found in the dictionary under “doesn’t take crap from people”. Marshall – A Canadian living in Hello House. Named after Marshall Eriksen from How I Met Your Mother due to his height and plans for law school. TimTam – Female Australian housemate from Hello House. Zoe – Female friend from Hello House who unfortunately had the noisiest room in the building – directly above the common room. Asako – musician from a Beatles cover band that played at the John Lennon Museum. Anzac – an Australian teacher at Kawasaki NOVA. He spent some time in the Australian Army. One of my regular post-work beer friends. Jem – A British teacher and long time karaoke companion. She had one of the best singing voices I have ever heard. Phoala – a Vietnamese-Australian teacher at Kawasaki NOVA. Never failed to put me in my place in hilarious fashion. Maria – a teacher at Kawasaki NOVA that was about 10 years older than the other teachers and looking for life experience. Wonderful, outgoing, uninhibited. Missippi Mark – English teacher that did training at the same time as me. Angie – A coworker at Mishima NOVA originally from Scotland. Her accent came out in a big way after a few drinks. Happyko – Friends with The Penpal and Klaxman. One of the friendliest people in the whole world. Kasparov – A coworker at Mishima NOVA. Was a part time programmer and chess expert. Koalako – an English student who became a good friend and drinking buddy. Is a classically trained singer with an amazing karaoke voice. Klaxman – Roommate from when I lived in Numazu. English teaching was his second career after being a game programmer for many years. Palmer – My big, bald Aussie roommate. 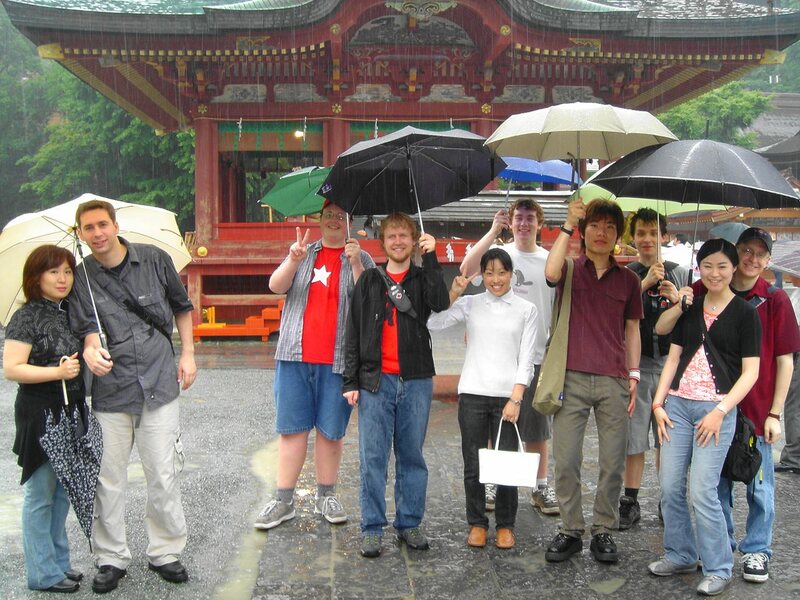 The Penpal / The Wife – My language exchange penpal from when I studied Japanese in University. She was my first Japanese friend. Lived in Numazu, Japan and studied English during University. We got engaged in early 2006. Vivian – A very friendly and outgoing teacher from England who I had the pleasure of working late Saturdays with. Flounder – Came to visit in 2004. Larger than a sumo wrestler but twice as awesome. Has an encyclopedic knowledge of The Simpsons. Hippie – Came to visit in 2004. Long time friend and drinking buddy who used to have long, flowing hippie hair. Was in my wedding party. Junk – My current gym buddy. Was the only non family person to see me off when I moved to Japan. Was the MC at my wedding. Sunny – Hippie’s wife who met me on one of my returns to Canada. Was in my wedding party. Triple D – Friend from my fraternity days who was my regular beer and pro wrestling buddy in University. Was in my wedding party.